One of the primary concerns of our friends and family when planning the trip was the “human element.” Not that bad people aren’t a concern, but so far people have been nice above and beyond the call of duty. 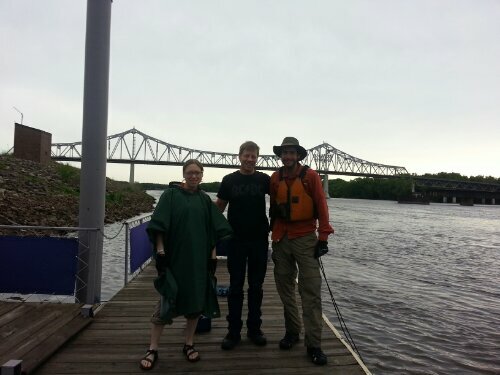 We were planning to do Lake Pepin in one day until Justin Staker, proprietor of Paddle Through It, offered his parents’ house partway through Pepin. 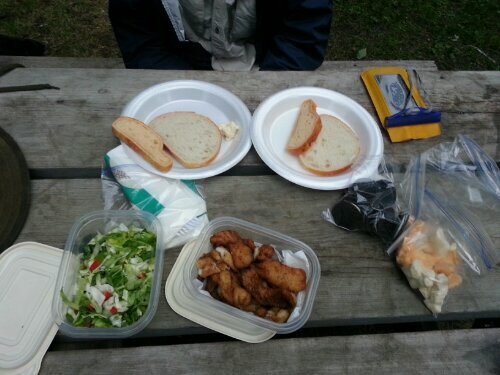 We got our own bunkhouse, a hefty dinner of brats, a generous number of beers, Dairy Queen and, on top of that, Justin took us on a tour of Old Frontenac and the bluffs at Frontenac State Park. We were so distracted by the amazing hospitality of Justin and his parents that we forgot to get a picture with them. 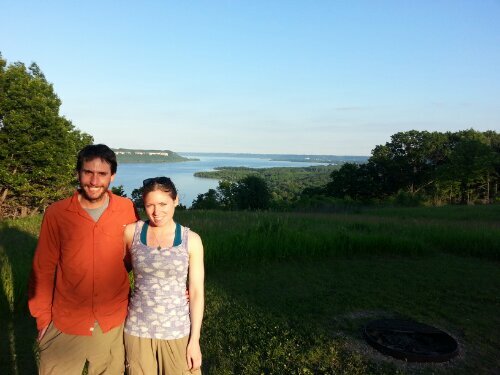 But here’s one Justin took of us on the bluffs overlooking Pepin. I also want to say Justin has been an incredible help in general, giving us everything from advice on the river, avoiding injuries as well as providing a free place to stay. Yesterday paddling past Winona we heard someone calling our names. Bert, who had found and commented on this blog, had come to one of the docks to bring us fresh fruit, protein bars and Diet Pepsis. Then we were looking for a campground near La Crosse because we needed to resupply there the next morning and wanted to be at a campground when expected severe weather was supposed to come last night. 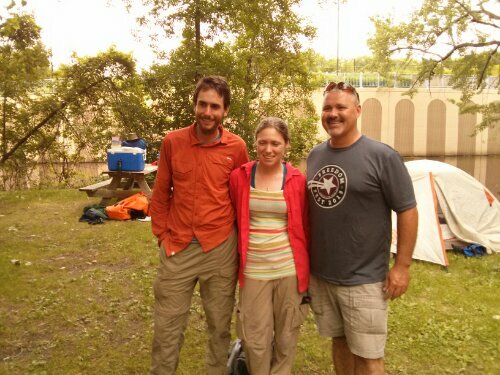 So we reached out to Jim, who lives in the area and also found and commented on the blog, and we asked him if there was a campground with easy access to La Crosse. He not only suggested one but scoped it out for us, gave us directions (the access was in a side channel) and delivered us fried fish, cheese curds, and oreos. As for the errands we had to run, John, another La Crosse area resident offered to drive us in to town. He not only drove into town but chauffeured around to the grocery and drug store and showed us the riverside park. It’s really moving to meet so many strangers who have reach out to us and provided unexpected but much appreciated help. It’s also been amazingly encouraging and has really helped us keep going. Even the dogs have been friendly. This one greeted us in Red Wing when we docked to grab a few supplies. His owner, who had paddled a section of the Upper River, pointed us in the right direction of the stores we needed to go to. Oh, and there was a big storm yesterday morning. 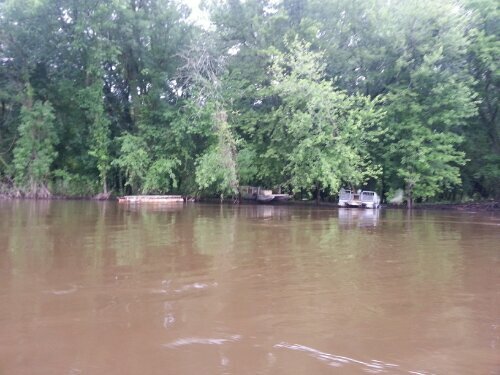 We survived, but this part of the river, about 4 miles from where we camped, not so much. Note this trampoline bent around a tree. On a more positive note, here’s a turtle run/sliding down the riverbank. 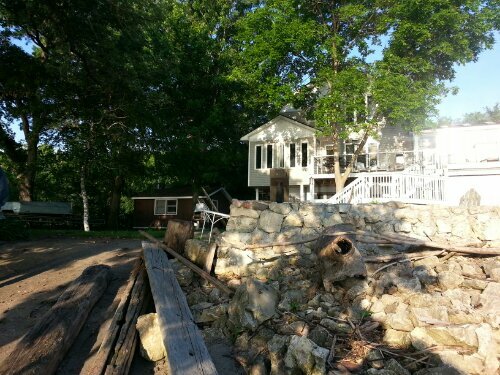 This entry was posted in Minnesota, Wisconsin by Dave. Bookmark the permalink. 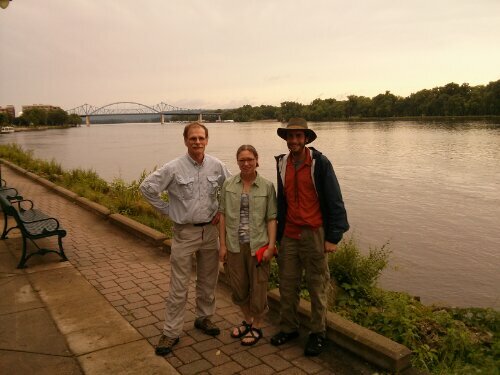 I very much appreciate the time you allowed me to spend with you two on Friday evening in La Crosse. Our friends and I were existed to hear about your trip and the chance to meet you. I hope you enjoyed the meal and La Crosse, WI. As I sit here tonight adding my comments, yet ANOTHER storm is hitting the area. While watching the storm roll thru, you two come to my thoughts with hopes that you are safe and dry. As we talked last night, I will be passing your information on to my family that is down river from Onalaska, (in Prairie du Chein, WI and Marquette, IA). If there is anything they can do to assist you while passing thru, please give them a call (I will send contact information via e-mail) or call my cell, and I will communicate with them for you. Thanks again for letting US ride along and having the chance to dream the dream with you. As always, Stay Safe, Healthy, and enjoy this time of your life. It was awesome meeting you. We survived the 8 hour storm, and our tent has been holding up surprisingly really well. We’re actually in Prairie du Chien the cheating way right now (some friends from MN picked us up from a landing at Lansing) but we’ll be heading through via canoe probably tomorrow. Would be great to get your family’s info in case. Also we’ll be going to bars in Prairie du Chien tonight if they want to join us for a drink. This post turned my heart into a deep well of emotion! This is awesome! I’m glad those people are looking out for you. 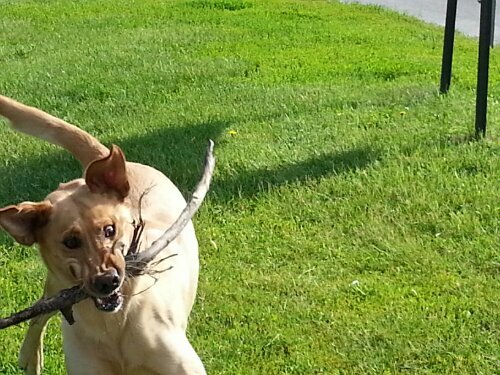 Also, that dog is making the CRAZIEST face! Also, Linnea, you are missing so much Paula Deen news. i loved this post–it made me very grateful for all the people you have encountered on your trip . glad you’re both doing well! and here are links to her various apology videos. crazy! Oh Paula, why? Thanks for the updates, it’s been hard to get Food Network news out here. I KNOW. People have been sending me updates various ways. I wanted to bring him with us. I miss you too. Sept is a very long way away. not sure whether you will be leaving Lansing or Prairie du Chien this morning(Monday) , so you are still 2-3 days from Bellevue, (75-100 miles, I will be heading for the Bellevue area tomorrow AM (Tuesday) so will be there when you go thru. Really looking forward to meeting/visiting with you. Ha, true! Not fazed by anything. People are awesome…. and people are hungry! I am ALWAYS hungry. I eat more than Dave. for when you return to new york: pie!